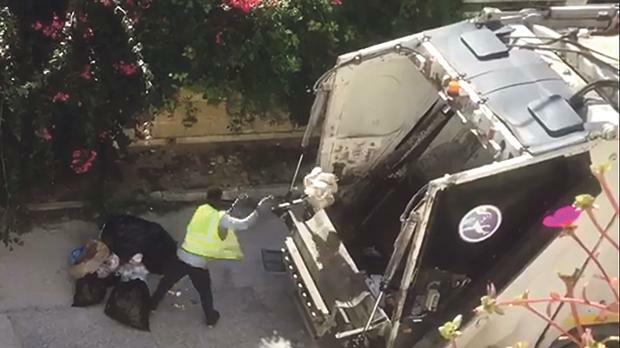 A still from footage showing a waste collection employee dumping white and black bags in the same truck during Monday’s collection in St Paul’s Bay. Law-abiding St Paul’s Bay residents were left fuming this week after seeing refuse collectors mix white and black garbage bags together, most likely sending their waste separation efforts down the drain. The issue came to the fore on social media when a resident uploaded footage of a waste collector making no distinction between organic and mixed waste. The resident expressed “disbelief” at the reply she received from the local council, which justified the combined collection on grounds that one of the white bags was “contaminated”. Her post, which contained the slogan #sortitout – the same used by the government to promote waste separation – immediately stoked controversy. Many questioned if the contractor would be fined, given that, by law, households committing such offences would be liable to a penalty. The Environment Ministry did not reply to questions by the time of writing and St Paul’s Bay mayor Anne Fenech only told the Times of Malta the council had spoken to the contractor “and Magħtab [the site of Malta’s only landfill] dealt with them from their end”. In a statement, Wasteserv said collectors had combined organic and mixed waste bags “in cases where the organic bag was taken outside after the collection of such waste had taken place”. About 440 tons of organic waste was collected over the past three days, it added. Concern about garbage bags being dumped together had been raised as soon as authorities announced that both organic and mixed waste would be collected on Mondays. The Environment Ministry insisted that contractors would either make separate rounds to collect either type of bag or install separate waste compartments in their trucks as a safeguard. In the run-up to the launch of the scheme last week, serious doubts had also been raised on how offenders who breached waste separation regulations would be identified. However, Environment Minister José Herrera has repeatedly dismissed suggestions of using a barcoding mechanism, through which each household would have its unique code attached to garbage bags. The latest such call was made by Labour MP Rosianne Cutajar in a parliamentary question. In his reply, Dr Herrera insisted that neither the councils nor waste collectors were equipped to manage such technology. It would be prudent for everyone to first get used to the recently-introduced waste separation system before studying whether to introduce barcoding, the minister said.